So what was involved in operating a salmon fishing station and what were the rules that had to be followed and abided by? I’ll try and cover this information in straightforward terms and how it was applied in the latter years of the inshore salmon fishing industry – technology in the early years would have been very basic and there would have been a few differences in how things were handled in the 1870’s when compared to the 1970’s. The salmon fishing season was established as running from 11th February to the 26th August every year. Before or after these dates no salmon fishing of any kind would have taken place along the sea coast. Each salmon station would have had a fishing coble, a sturdy and solid wooden vessel which was generally flat-bottomed and around twenty five to thirty feet in length. This type of vessel was best suited to haul and remove nets and anchors, as well as being able to accommodate a crew of five or six men. Generally speaking each salmon fishing station used to work a total of around ten salmon nets, in the case of Portlethen in the 1970’s they normally operated a total of twelve nets that covered an area from just south of Cove Bay harbour at the northernmost point of their allocated boundary to the southernmost point at “Through Gang Point”, midway between Portlethen and Downies Village. The main nets themselves are called bag nets. Bag nets could be either double or single headed, meaning they have either one or two courts to trap the fish when they swim against the leader net, which is attached by an anchor to the shore. Bag nets are held in place by two or three large spade bladed anchors (the number can vary according to the availability of fixed anchor points on nearby rocks). These anchors are lifted in late summer at the end of the fishing season. 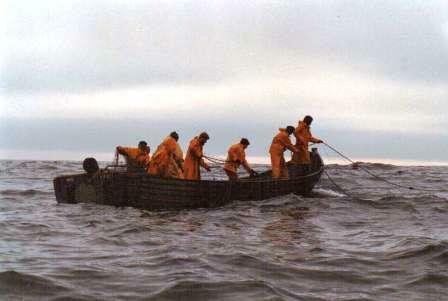 The leader net is first attached to the bag net and then paid out to landward and is attached to a stake pole that is positioned and anchored on the sea bed. Supported by floats along its upper edge and weighted down by small lead weights along its bottom edge, the leader forms a curtain of net that directs salmon into the bag net and finally into the fish court. By law the leader nets were removed from the sea before noon on a Saturday and replaced once again after 6 am on the following Monday morning, thus allowing any fish “free passage” up river between these times. The process of removing these leader nets was known as “slapping”. 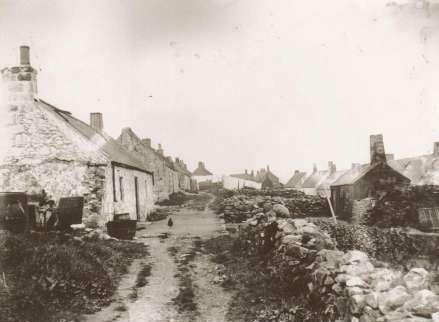 If stormy weather occurred on a Saturday morning that prevented the men getting to sea to remove these leader nets there followed a “keep in” where the men would wait at the station until later in the afternoon in case a weather window appeared to allow them out to sea to remove them. 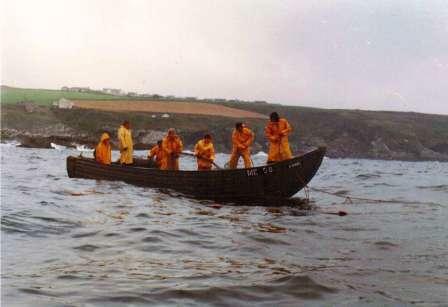 Often the weather did not improve and the men had to return on a Sunday to try again but if that failed and the weather was too foul to put to sea at all the leader nets had to be left in the water over the weekend. Caring for fishing nets was always a time consuming but necessary job. If the nets were to last they needed to be maintained and this meant they had to be periodically removed from the sea and dried, whilst making any necessary repairs at the same time. Normally the fishing crews would work out a cyclical rota in respect to their nets so that two or three of them were changed out every week which meant the fleet would remain “fresh” and relatively free of major damage. 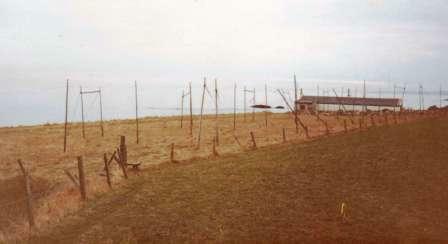 Nets that were removed from the sea needed to be dried and in that respect most salmon stations had small parcels of land or “drying greens” for that purpose. Bag nets would have been hung to dry from posts and cross spars – to see bag nets hanging out to dry is like looking at how they would sit whilst in position in the sea. After removal of the leader nets prior to the weekend, these too would be set to dry on the drying green, although it was more likely that they would have lain flat on the ground. The amount of fish caught fluctuated greatly and could vary between 1500 and 3000 per season, although in the latter years the numbers appeared to be in terminal decline. As a child I recall being on the shore and watching catches of over 100 fish daily being offloaded from the coble into boxes on the beach. 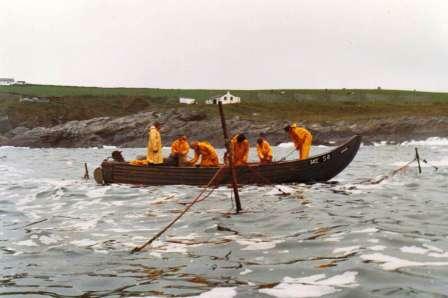 By the time I worked at Portlethen there was never a day where we caught anything like that number of fish. In addition to salmon, grilse (young salmon) and trout were also caught in the nets fairly regularly throughout the years.